Address: 662710 Krasnoyarsky Krai, pos. Shushenskoye, Zapovednaya st., 7. 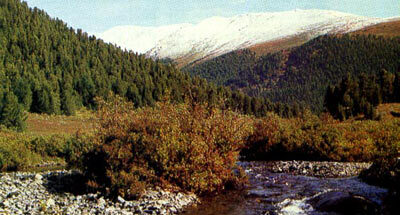 Zapovednik Sayano-Shushensky, in south-eastern part of Krasnoyarsky Krai, was founded in 1976. Its area is 390,4 thousand ha. 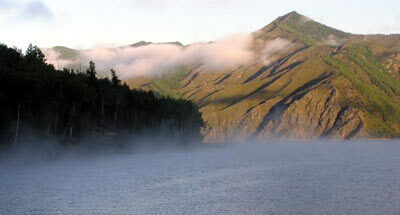 It is located on the left bank of Yenisei, in the central part of Western Sayan. The relief is middle- and high-mountainous, and has a maximum height of 2772 m above sea level. The ridges are cut with canyon-like valleys. In the plant cover height belts are expressed. On the lover parts of the slopes larch forest-steppe is found, on northern slopes dark coniferous forests of Siberian pine (cedar), Siberian fir and Siberian spruce are spread, changing higher up to pure cedar forests; at the upper border of the forest are moss cedar forests. In the high-mountains alpestrine and alpine meadows (fragmentary), mountainous tundras (lichen and rocky) have developed. On southern slopes light coniferous taiga dominated by Siberian larch prevails. As a whole forests occupy about 60% of the territory. Flora has mixed character, including representatives of several floristic Districts with large number of endemic species — Sayan-Altai endemics (Poa altaica, Agropyron krylovianum, Aquilegia borodinii, etc. ), Angara-Sayan endemics (Anemonoides jenisseensis), and Tuva-Sayan endemics (Silene turgida). Relict plants are many (Cruciata krylovii, Rhododendron dauricum, Thalictrum baikalense, etc.). The total number of registered vascular plants is more than 1000 species, including rare — Dendranthema sinuatum, Epipogium aphyllum, and Anemonoides baikalens. 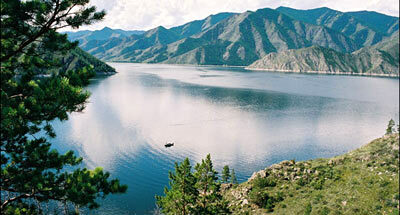 Fauna includes representatives of Altai-Sayan, and Mongolian wildlife. More than 50 mammal species are recorded, including Siberian roe, musk deer, maral, wild reindeer, elk (not numerous), Asiatic ibex, sable, common weasel, brown bear, wolf, scunk bear, and lynx. Of rare species, included in the Red Data Book of Russian Federation, are snow leopard, and Pallas’ cat. Birds account for 250 species, including nutcracker, wood grouse, hazel grouse, black grouse, Daurian partridge, and kestrel. Among rare birds are Baikal snow partridge, golden eagle, saker falcon, and peregrine falcon. Fish make up 20 species, including Siberian grayling, taimen, and lenok. Reptiles account for 5 species (Elaphe dione, mocassin, etc. ).